Lewis did not carry the ball in Sunday's 33-17 loss to the Colts. He did add three catches on four targets for a total of 23 yards. Lewis totaled five yards on three carries in Saturday's 25-16 win over Washington. He also added three catches for 20 yards. Analysis: Lewis continued his fall out of fantasy relevancy Saturday, totaling only six touches in comparison to Derrick Henry's 22. He did have one highlight-worthy play, taking a short dump-off from Marcus Mariota and converting it into an 18-yard gain. Other than that play, Lewis did little of note, averaging only 1.7 yards per carry. He cannot be trusted for a big role in the team's regular-season finale against the Colts. Lewis carried the ball seven times for 35 yards in Sunday's 17-0 win over the Giants. He also added three receptions for nine yards. 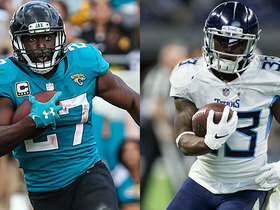 Analysis: Lewis found himself on the short end of the running back split for the third consecutive week, racking up seven carries compared to Derrick Henry's 33. The rainy conditions of this game benefited the playing style of Henry over Lewis, though Lewis has now failed to earn 20 touches in a game for five consecutive weeks. Due to that lack of volume, he's only a desperation play in PPR leagues moving forward. 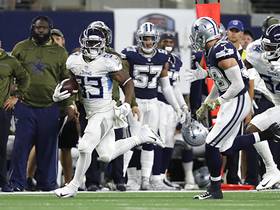 Lewis rushed 10 times for 13 yards and brought in all five of his targets for 39 yards in the Titans' 30-9 win over the Jaguars on Thursday. Lewis carried the ball six times for a total of 36 yards in Sunday's 26-22 win over the Jets. He also added two receptions for minus-2 yards. 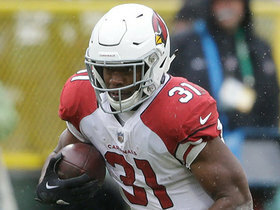 Analysis: Lewis posted a season-high 20 carries in Week 10 against New England but has steadily seen his workload decrease since. That didn't change Sunday, when he saw a total of eight touches -- his lowest mark since the Titans' contest against Baltimore in Week 6. His lack of involvement in the passing game is especially concerning, and he has logged two or fewer receptions in three of his past four contests. Given his dearth of touchdowns, his fantasy floor appears limited at the moment. Lewis rushed seven times for eight yards and caught all seven of his targets for 33 yards in Monday's 34-17 loss to the Texans. Lewis carried the ball 10 times for 24 yards in Sunday's 38-10 loss to the Colts. He also added one catch on two targets for eight yards. Lewis rushed 20 times for 57 yards and caught both of his targets for 11 more in Sunday's 34-10 win over the Patriots. 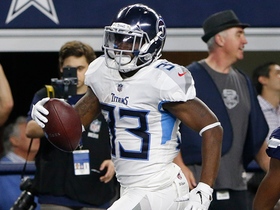 Analysis: Lewis got twice as many touches as Derrick Henry, but Henry had the better fantasy day by virtue of scoring two touchdowns. While Lewis' versatility gets him the majority of work, Henry's bulkier frame is more effective near the goal line. Considering Henry has four touchdowns in the past three weeks, he's likely to keep cutting into Lewis' value against the Colts in Week 11. Lewis rushed 19 times for 62 yards and caught all four of his targets for 60 yards and a touchdown in Monday night's 28-14 win over the Cowboys. 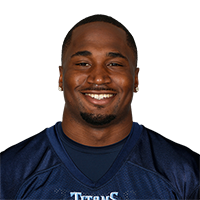 Tennessee Titans running back Dion Lewis runs for 14 yards on a screen pass from quarterback Marcus Mariota. 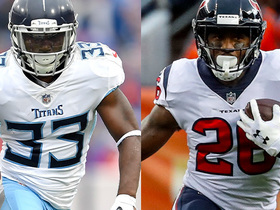 NFL Senior Fantasy analyst Michael Fabiano and NFL Network's Maurice Jones-Drew predict how the running backs will do in the Week 12 matchup between the Houston Texans and Tennessee Titans. 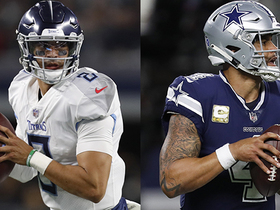 The "NFL Fantasy Live" crew discuss the fantasy fallout from the Week 9 Monday Night Football game between the Tennessee Titans vs. Dallas Cowboys. 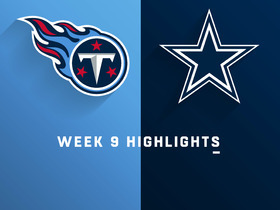 Watch the highlights of the Week 9 matchup between the Tennessee Titans and the Dallas Cowboys. 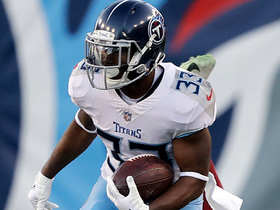 Tennessee Titans running back Dion Lewis turns short catch into 37-yard gain. 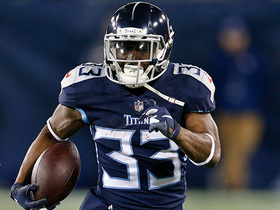 Tennessee Titans running back Dion Lewis shows a burst of speed for a 18-yard touchdown.